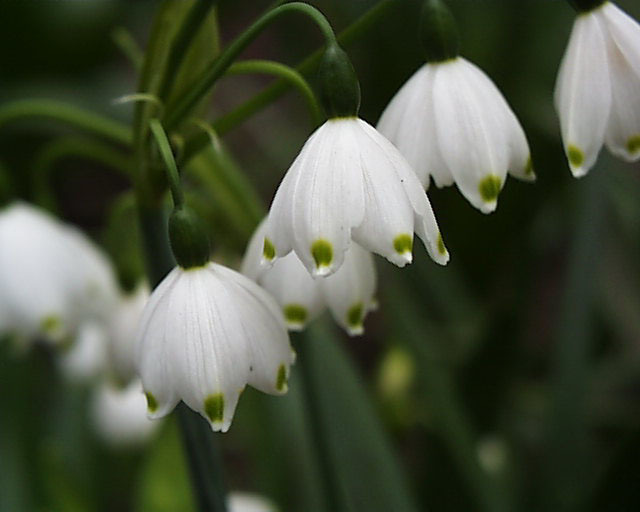 Leucojum is an European genus with species commonly known as "snowflakes" and often regarded as the poor relation of Galanthus with species known as "snowdrops". Species are regarded as hardy in the south of England, New Zealand, Australia and the southern states of the USA. 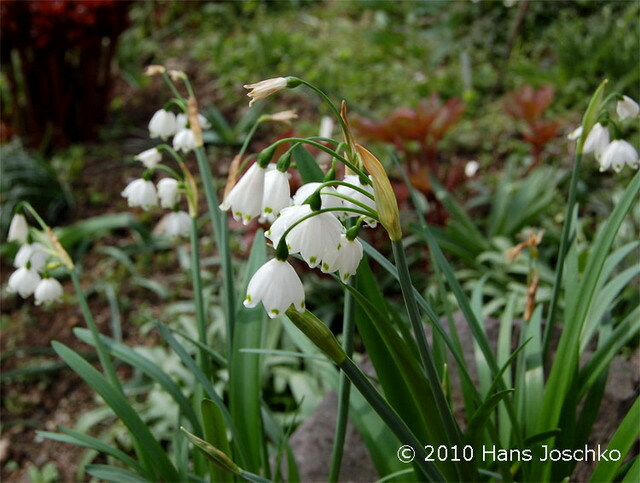 Leucojum is a member of the Amaryllidaceae family. The genus Acis was created in 1807 by R.A. Salisbury. 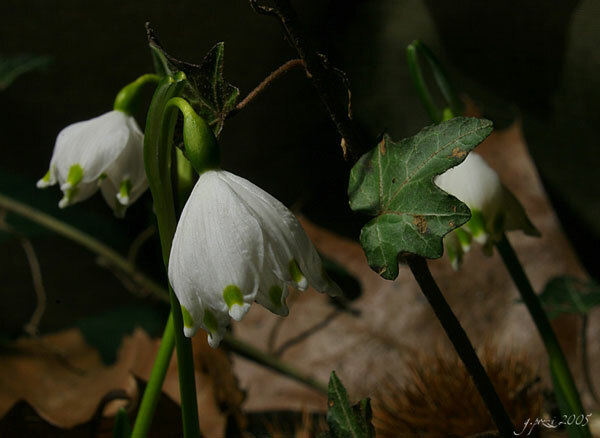 In the 1880 the species in this genus were lumped into Leucojum. Dolores Lledo, Aaron Davis, Manuel Crespo, Mark Chase and Michael Fay from RBG Kew in a paper written July 2004 to be published entitled Phylogenetic analysis of Leucojum and Galanthus (Amaryllidaceae) based on plastid matK and nuclear ribosomal spacer (ITS) DNA sequences and morphology have determined that Galanthus is most closely related to Leucojum and that the species formerly included in Acis should be returned to Acis. These species are the small species with narrow leaves and unmarked flowers. 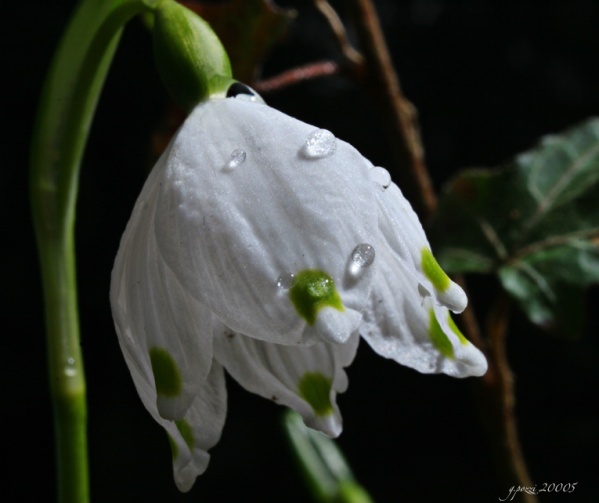 The only species to be retained in Leucojum are the robust, wide-leaved, green-marked Leucojum aestivum and Leucojum vernum. 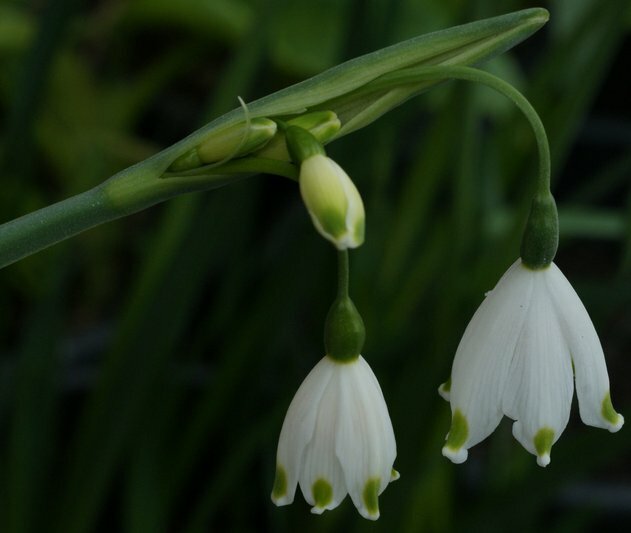 This information was provided by John Grimshaw as is the information below describing the difference between the subspecies of Leucojum aestivum. 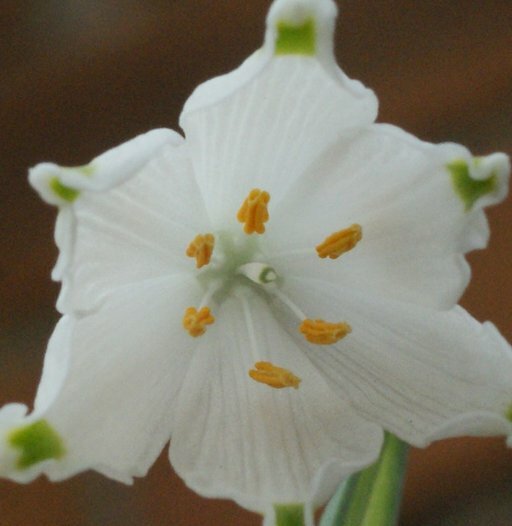 The smaller species once known under the name Leucojum can now be found on our Acis page. 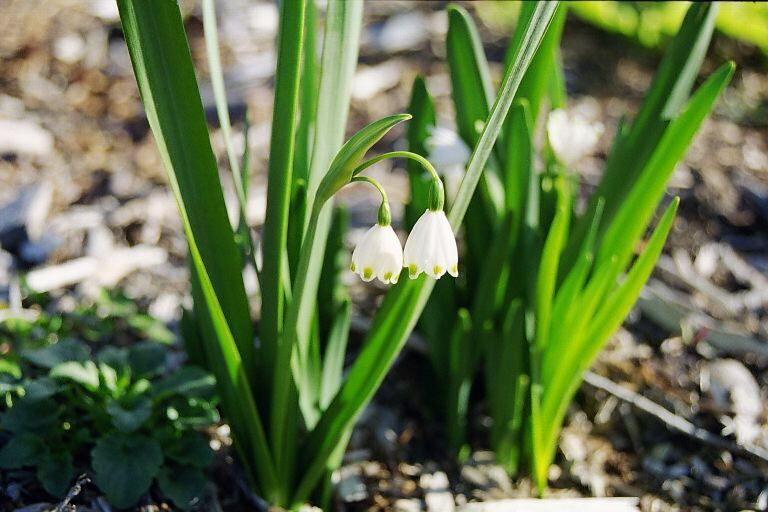 Leucojum aestivum L. is found across Europe to the Crimea and the eastern side of the Black Sea. It flowers in mid winter in Tasmania contrasting its common name of Summer Snowflake. Grown and photographed by Rob Hamilton. 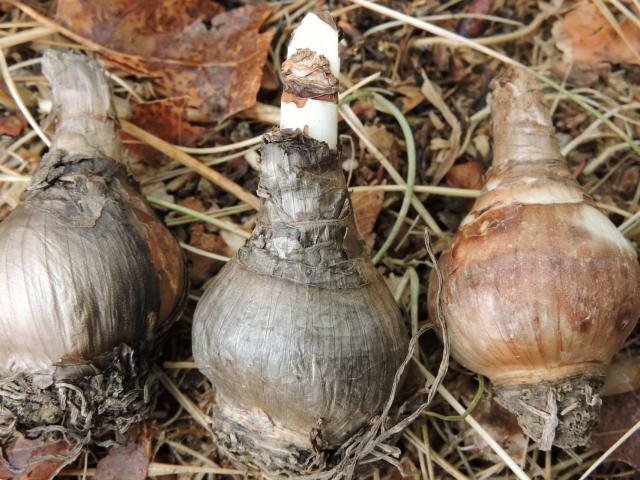 Bulb photo by Travis Owen, shows bulbs that closely resemble bulbs of Narcissus, but differ in having active leaf growth in the Autumn (and even Summer). 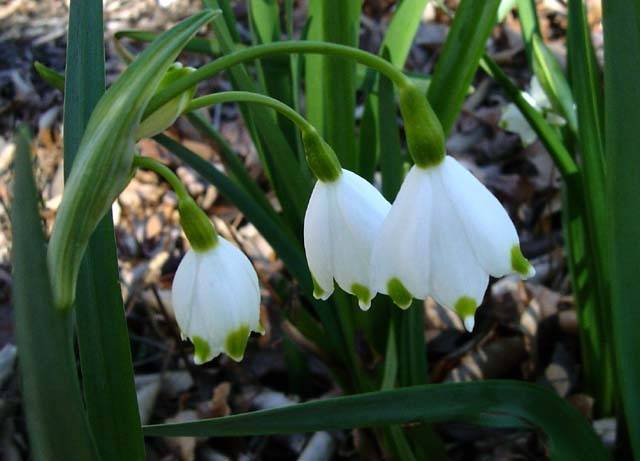 There are two subspecies: Leucojum aestivum ssp. aestivum and Leucojum aestivum ssp. pulchellum. In L. aestivum the scape is somewhat flattened and it has two 'sharp' edges. 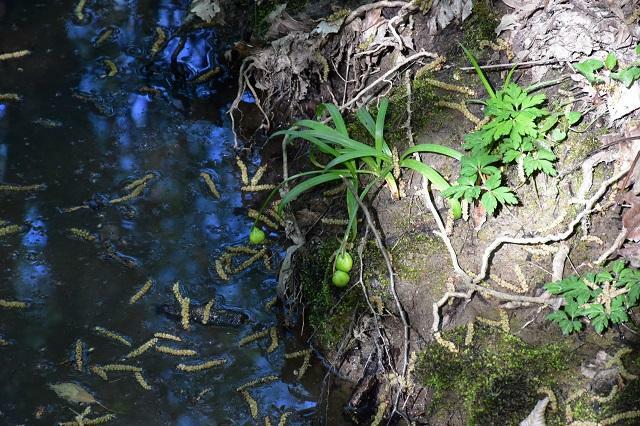 This edge is what botanists term scarious, i.e. unpigmented and translucent, as can be seen if you hold it to the light. In ssp. aestivum this margin has a scattering of minute bumps along it. They can be seen with the naked eye, but a lens would be better, and they can also be felt if you run a finger along the edge. These bumps are said to be always absent in ssp. pulchellum. More useful for gardeners is the fact that ssp. pulchellum flowers 2-3 weeks earlier than ssp. aestivum, with smaller flowers. Photo taken January 2007 by Jay Yourch. 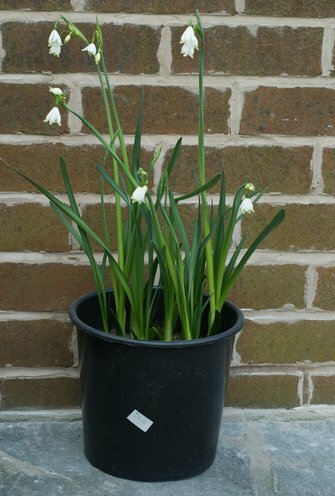 Leucojum aestivum 'Gravetye Giant' is undoubtedly a selection of ssp. aestivum, distributed from William Robinson's garden at Gravetye Manor (near East Grinstead, West Sussex, England) many years ago. 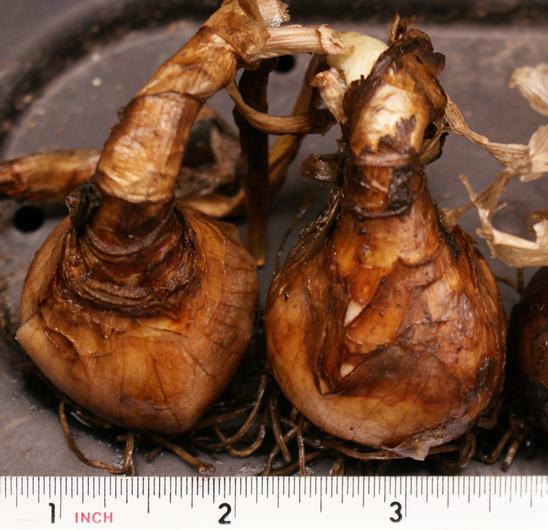 It is bigger than the average L. aestivum seen in gardens. First photo by Arnold Trachtenberg, second photo from Hans Joschko, rest by David Pilling. 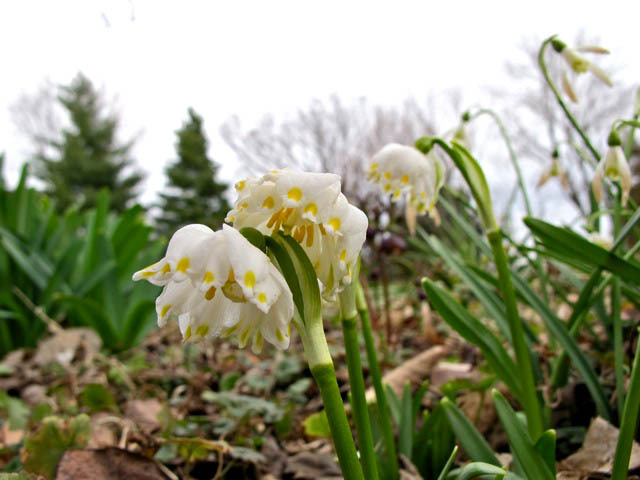 Leucojum vernum L. or Spring Snowflake is native to Central Europe where it is found in damp places. It differs from L. aestivum in earlier bloom and having flowers singly or in pairs. Photos No. 1 and 2 by Giorgio Pozzi, February 2005; photo No. 3 by Gianluca Corazza, April 2016. 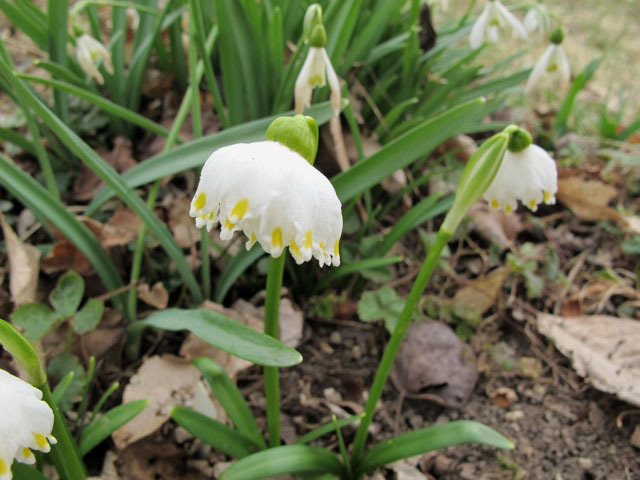 Leucojum vernum var. carpaticum Sweet differs from the typical species in having yellow spots at the edge of each floral segment. It is native to Ukraine, Romania and Czechoslovakia. The cultivar 'Gertrude Wister' is special because of its additional petals. This cultivar is believed to have originated from the Wister garden at Swarthmore College, Swarthmore, PA. It is registered with the KAVB. 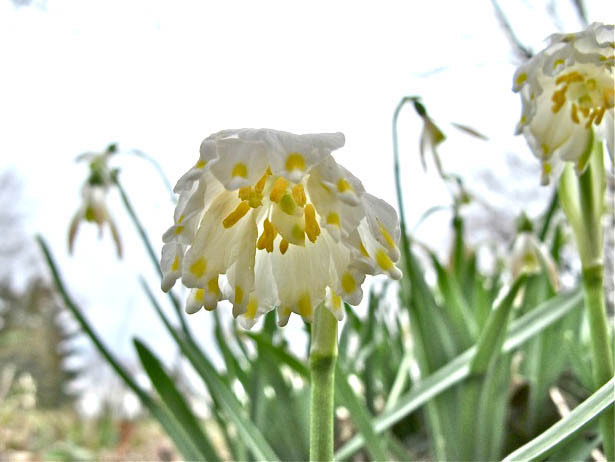 It blooms for Jim Waddick in Kansas City, Missouri in Early March. The following three photos of 'Gertrude Wister' are by Jim Murrain.